Well, I know , these ingredients are not the first to think about when you say PIZZA. Not even the last because ...potatoes...on a pizza...? ?Come on !!! But this month challenge of the Bread Baking Babes made me change my mind. coming from the Sullivan Street Bakery ,named for its street in the SoHo section of New York City. Although I had my Kitchen Aid to do the dirty job for half an hour , it just turned out to be...Yakk !!! But standing strong , I poored it in a baking tin and made my topping. 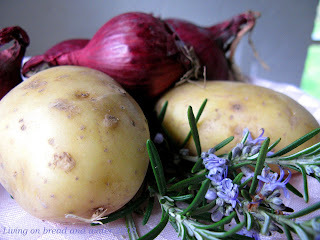 Thin sliced and drained potatoes,chopped onions ( supposed to be white or yellow but I only had red ones in store ), fresh Rosemary leaves and all of this husseled with a good olive oil and sea salt. Spreaded it all over the dough and baked in a pre-heated oven of 220 C. With no hope of any eat-able result. But guess what.....it turned out great. The dough became a thick Foccacia - like bread and those potatoes tasted like....cheeselike and not like potatoes anymore, great. Only the onions turned into a very dark untasty color.Indeed the recipe said to use yellow or white onions, so I made that mistake already for you. Anyway , the family liked it and the pizza/Foccacia turned out to be too little. But that was my mistake too , had I read my fellow BBB's comments first ...I'dd knew it would be tasty enough to make a double batch . Always trust a BBB . And look at this... the bread was great , airholes as they should be ,but look, only a little tiny bit left to take a picture off......'cause we knocked that Pizza down ! For the complete recipe knock at the door of this month kitchen :where you also can earn your BBB-buddy logo from this month by baking this pizza with us and letting us know. And don't forget to take a look at some of the other BBB's blogs ( on the right) to find out how they celebrated "Pizza-time !!! 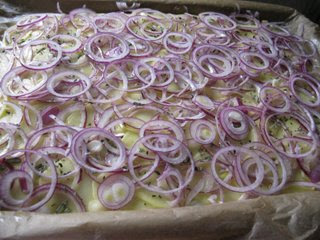 For the recipe in Dutch you have to take a look in the kitchen of Lien. Monique, you made a amazing, fantastic looking pizza there. Wow, I bet your family liked that! Great job!!! Looking great! Love that first photo! I made it, waited literally to the last minute but you were right, worth making! Now, how did you get that puppy to rise and shine like that. Sheese, makes me think I need to try it again. I think you are a star Monique! Beautiful pizza! How did you get such great looking holey dough! Mine wasn't that puffy inside. IT sure was a wet dough. I'm thinking I'm heading to your house for pizza next. Love, love, love the way the crust looks!!!!!! I wanted my crust like that! Perfection. Very very nice! I wanted to use red onions, but we had none in the cupboard. I agree with Baking Soda, that first picture is really pretty.